My husband took a year of Italian in college, and at one point during the semester his professor recommended a local restaurant where students could both practice their skills and enjoy an authentic meal. This restaurant was part-deli, part Italian grocery, and part trattoria, and it was here that we began ordering appetizers at every meal. Very specifically, for the next two years I would order bruschetta whenever it graced a menu. It was our "thing" during this phase of our lives, and part of the fun of going out was our never-ending search for the very best bruschetta. Simple? Yes. But in fact, a lot can go terribly wrong with bruschetta. The bread can be too thick, or not toasted. The tomatoes can be out of season. The garlic can be too heavy handed. But when the flavors are perfectly blended, there's absolutely nothing better to eat on a warm summer day. When Marie Murray submitted a few poems, she explained that she had recently completed a series of word memories, two involving food. This one peaked my interest and appetite, as it's timed well with tomato season, and gustatory by definition is "relating to or associated with eating or the sense of taste." When I first read this short poem, bruschetta was the first recipe that came to mind. To accompany the definition above, bruschetta is well-suited for a pairing because with only a few ingredients, the true flavors of a tomato are able to shine, enhanced only by a few strands of basil and a hint of garlic. The poem is lighthearted and brief, but it captures the season, particularly the phrase "a current of gustatory delight." Eating a perfectly sun-ripened, in-season tomato is utterly delightful indeed. It's pure summer, pure joy, and because the season comes just once a year, it forces you to savor every bite. The beauty of bruschetta is it can be made ahead, benefits from resting at room temperature, and, when tomatoes are at their peak of ripeness, one of the most satisfying additions to a meal. I prefer to enjoy the flavor of garlic without biting into a piece of clove, and find that grating it finely on a microplane helps the garlic infuse with the oil instead of overpower the dish. If you'd like to dress it up even more, add a drizzle of aged balsamic, or a smear of goat cheese. 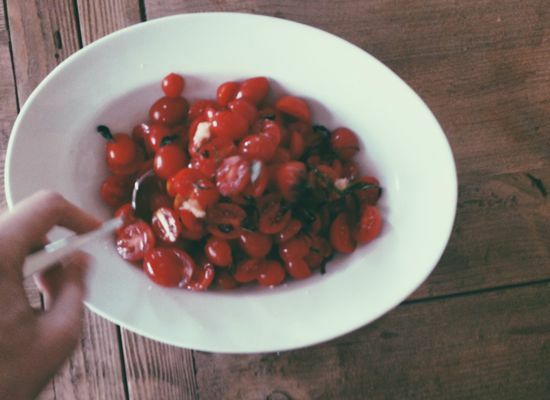 Place the tomatoes in a medium bowl and add the garlic, basil, a pinch each of salt and pepper, and about a tablespoon of oil. If you have a small bottle of drizzling oil that you save for special occasions, this would be an excellent time to use it. A small amount is required, but since the ingredient list is short, a stunning oil will shine here. Give everything a good stir, and be sure the garlic is evenly distributed. Allow the tomatoes to sit at room temperature, preferably for 1-2 hours, before serving. Before you're ready to eat, preheat the oven to 425°F and place the baguette slices on a sheet pan. Drizzle with oil, then toast for 8-10 minutes, or until beginning to turn golden brown around the edges. Serve alongside the tomatoes.